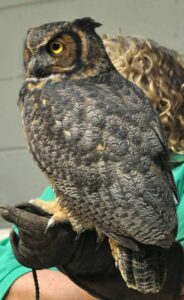 Freedom Center for Wildlife, Inc. is a 501(c)(3) non-profit organization incorporated in April of 2006 to fill a need in the wildlife rehabilitation community. 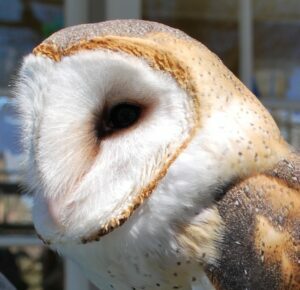 Our mission is to increase public knowledge and appreciation towards the conservation, protection and preservation of native New Jersey habitats and animals through rehabilitation, education, and research programs. Working out of a home-based garage, close to 100 animals were brought into the Center’s care in 2018. Our educational programs reached over 2,000 children and adults throughout southern New Jersey. Our current all-volunteer staff is growing due to the community’s recognition of the Center’s services and their willingness to help. Freedom Center’s hope is to help maintain the state’s precious wild animal populations, educate the public about wild spaces and the animals that inhabit them, and to gather information about behavior, habitat and disease. Our many volunteers assist in these endeavors, helping with animal care, transport, educational programs, training, and office work. manage native wildlife populations, but cannot care for individual animals that become injured, orphaned or displaced (most often as a result of human activities). Wildlife rehabilitators are often sought out by the public when they find injured or orphaned wildlife. 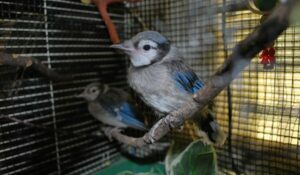 Currently, there are no licensed wildlife rehabilitators in Camden County and only 2 in Burlington County. We seek to provide a resource for these areas. While we provide a valuable service to wildlife in our state, we operate only thanks to donations. The cost of rehabilitating one animal, from intake to release, can cost upwards of $300 depending on the level of care and medications the animal may require. That number is considerably higher if the animal cannot be released back into the wild and is a candidate for becoming a permanent education ambassador. In order for the Center to provide a permanent home for these animals, we would need to construct specific habitats tailored to specific animal needs while adhering to state and federal regulations. Cases like this come to us frequently. Proper funding would give us more options for extending treatment or providing permanent options, rather than euthanasia. This year was a surprise to all of us, as intakes were much lower compared to all of our other years. This seemed to be the trend at many other rehabilitation centers as well. We still had majorities of our usual animals, including squirrels and robins, but other common species, like opossums and sparrows, were not represented as they usually are. But our consistently above average release rate was the best year ever, at a whopping 82%! One of these releases was our beaver brought to us after being found on the Rancocas River being chased by another adult beaver. 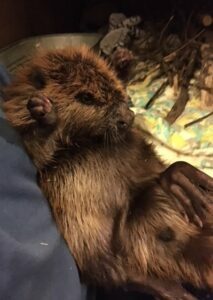 From intake to release, beavers are kept for 2 years until they are mature. He grew from a tiny kit the size of a guinea pig, to a whopping 40 pounds by release day! You can see him here in these pictures, from a little guy at intake to a hefty and healthy adult at release. But of course nature doesn’t give us a break-we got in yet another little beaver kit later that spring. She is doing well and will be released in the spring of 2020! We also received a large number of bats, both big browns and reds. 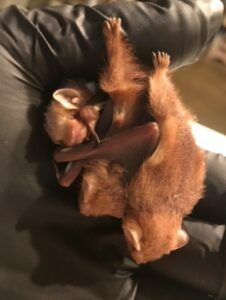 Freedom Center is the only facility licensed for bats and beavers in southern New Jersey, so we always seem to have them in our rehabilitation center. This year also became the year of repairs. 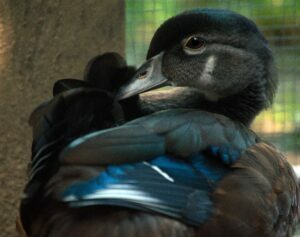 Our avian enclosures have had roofing repairs done to remove rotted areas caused by the excessive rain we saw. We were able to raise some of the funds needed through Facebook campaigns and event fundraising. We are also applying for grants to hopefully receive the funds necessary to expand these enclosures and continue repairs on some of our other buildings. We had successful events in both the spring and fall this year. Our Brunch with the Bunny event brought children and their parents to hunt for eggs, meet our Animal Ambassadors, and jump in the Bounce House! Our fall Oktoberfest featured a nice selection of craft beers and authentic German food. Our wonderful assortment of auction gift baskets at both events attract lots of bidders too! We hope to start another annual fundraising event in the summer months next year in addition to our spring and fall events. The overall expenses for 2018 were $12,436.04. The total actual income for 2018 was $15,391.61. This includes educational outreach ($1,350.00), corporate donations ($1,481.88), public donations ($4,525.35), fundraising ($4,525.39) and grants ($3,500.00). Our overall in-kind support is estimated to be over $200,000.00. 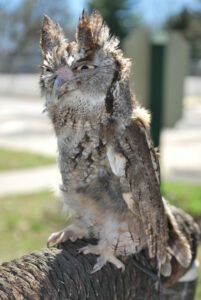 Freedom Center for Wildlife, Inc. is still looking for a permanent home. The needs for a Center open to the public grow year after year. Ideally we are looking for 10 acres of land, adjacent to fresh water. The Center would be open to visitors. It would offer a variety of services including rehabilitation for injured and orphaned wildlife, a nature center for public education, as well as a facility to house groups and recreational services like birthday parties. It would also include enclosures for permanent residents and medical buildings. A large contribution of $500,000, or a donation of land and a capital goal of $200,000 would give Freedom Center for Wildlife “new” life.